A federal judge has ordered immigration officials to reunite all migrant children 5 and older with their parents by Thursday — but officials' own data shows that will be near impossible. After splitting thousands of families at the border, the federal government faces a Thursday court deadline to put them back together. But based on federal officials’ own data — and their record on reunifications so far — it would be near impossible to reunite all families by that deadline. On June 26, a federal judge in California gave the government a month to reunite children ages 5 to 17 with parents separated from them at the border. But with just three days to go, only 879 reunifications have taken place, leaving nearly 1,700 children in that age group still waiting, according to government data filed Monday. 538 more parents have been cleared to be reunified with their children, meaning reunification is likely. All told, that’s significant progress since the government’s last update on Friday, when just 450 reunifications for the age group had taken place. Still, the circumstances remain murky for more than 1,000 other parents. There are 217 parents squarely in the “maybe” category because they have already been released into the United States, making them more difficult for government officials to locate. And 917 have been deemed “ineligible” for reunification or likely ineligible based on a host of factors, such as prohibitive criminal records or the vague need for “further evaluation.” In more than half of those cases, the parents are not in the United States, suggesting they may already have been deported. A total of 900 parents have final deportation orders, though a federal judge has temporarily blocked the government from deporting families as soon as they are reunited. Family reunifications are a tall order, to be sure. Once split apart, parents and children were swallowed up by separate federal agencies — the children housed in shelters run through the Office of Refugee Resettlement, while parents were criminally charged for illegal border crossing and then shuttled to immigration detention centers run by Immigrations and Customs Enforcement. Kids have been placed in shelters across the country, and their parents could be anywhere in the United States — in immigration detention or released — or already deported back to their home countries. Even as the government separated families at the southwest border, there was little clear infrastructure for keeping kids and parents matched up. The family separation policy began “without any effective system for ... reuniting the parents and children,” wrote U.S. District Judge Dana Sabraw, who has ordered the family reunifications. “Under the present system migrant children are not accounted for with the same efficiency and accuracy as property,” he added in a June 26 order. And even as the deadline approaches, many parents have had little ability to communicate with their families or the lawyers helping facilitate their reunifications. Thursday is the second court-ordered reunification deadline federal officials have faced after the American Civil Liberties Union successfully took them to court to order families be brought back together. The last deadline, July 10, was for children under 5. Two days after that, officials announced they had reunited 57 out of 103 toddlers, declaring the other half “ineligible.” But in many cases, the reason for ineligibility was the government itself: Children could not be reunited, for example, with parents who had already been deported by immigration officials. Other parents were difficult to locate because the government had released them into the country’s interior. Lawyers for the federal government said last week that they have been able to locate most of the older children’s parents who were released from ICE custody into the United States, a number which stood at 217 as of Monday. The government has reunited 429 children since its last report on Friday, suggesting the process is chugging along. But there are steep challenges to bringing those families back together. Lawyers for the federal government have emphasized the legal and logistical difficulties, laying out convoluted flowcharts and procedures dominated by jargon. Before bringing families back together, the government runs through a series of checks. First, officials confirm parentage, generally using a DNA test. 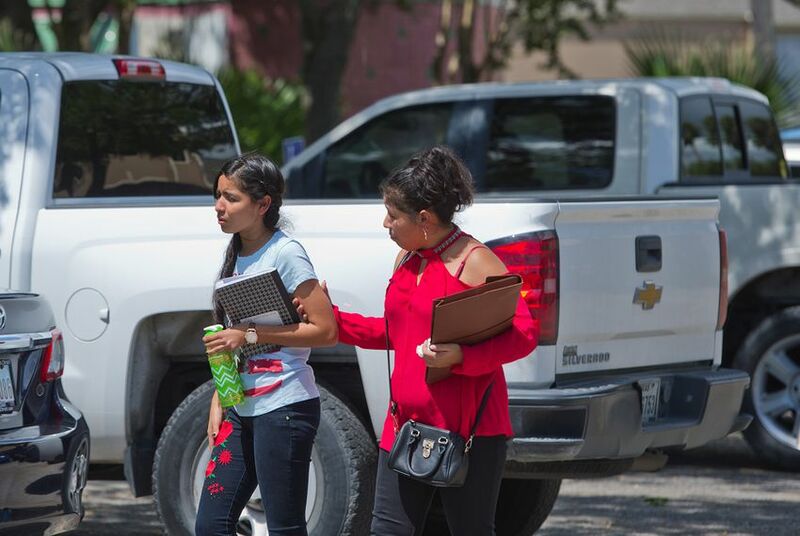 Then officials look for “red flags” — like a parent’s criminal background, or any indications that the child may be a victim of trafficking — before clearing the parent for reunification. Reunifications can also be delayed if the child has become ill while in government care. And parents are asked whether they want to be reunified with their child at all — a right 130 parents have declined, according to government documents. The ACLU has openly questioned that number. A status conference is scheduled for Tuesday evening in San Diego to brief the judge on the progress. Correction: In the summary text below the headline, a previous version of this story gave the wrong age range for children who need to be reunited by the Thursday deadline. The children are 5 and older.